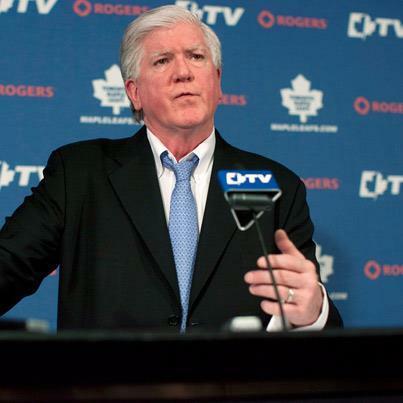 Today's press conference held by former Maple Leafs General Manager Brian Burke was interesting to say the least. Brian Burke read his speech that he had written, and then he fielded questions from the assembled media. It was here that the fireworks began as Brina Burke became the honest, candid Brian Burke that everyone either admired or hated. And it sounds like he's not at all happy with being removed from his position with the Leafs and the way it was handled. Needless to say, vintage Brian Burke was back today, answering questions and leaving a lot to interpretation with his answers. Burke's speech was diplomatic, and he seemed very honest in his thanking of the various people he read off as well as wishing good luck to a number of the men he brought into the Leafs' fold while he was there. I honestly believe that Brian Burke meant every word he said to the men he left behind. But things dramatically turned once he opened the floor to questions. "There are sometimes when you get fired and you see the vultures circling and you understand it's coming. You’re not sure when you’re going to drop dead in the desert but it's coming. This one was like getting a two-by-four up side your head. I would have liked to have finished the job. I was stunned by the turn of events." Wow. So if Brian Burke didn't see it coming, no wonder it caught everyone else off-guard. He reiterated over and over today, though, that the reasons given to him for his dismissal "were not satisfactory" in his view. You have to wonder what those reasons are, but Burke was asked if he would be interested in another GM position for a team in the NHL, and he indicated he was definitely still interested in running a team. "I can stand here and say it's my personality, they didn't like my personality, but those all become pretexts and excuses later. If you've won enough games, you can be as obnoxious if you want to be." The truth is that his 128-135-42 record as the Leafs General Manager is very pedestrian in impressing anyone with his ability. I'm not here to make excuses for Brian Burke either. His record speaks for itself, and he was relieved of his duties. While his abrasive style may have have been an additional motive, the fact that he was seven games below .500 in his three-and-a-half years at the helm is enough to warrant a dismissal in professional sports. Burke did clarify that his role currently with the Leafs is as a senior hockey adviser to the Board of Directors at MLSE, but I'm quite certain he's not interested in helping MLSE after having the Board of Directors sign off on his dismissal. He did, however, say that he would make himself available for newly-appointed GM Dave Nonis whenever and where ever Nonis asked. "We didn't win," said Burke today. "Obviously, your job as the GM is to bring in players that win. We didn't win."